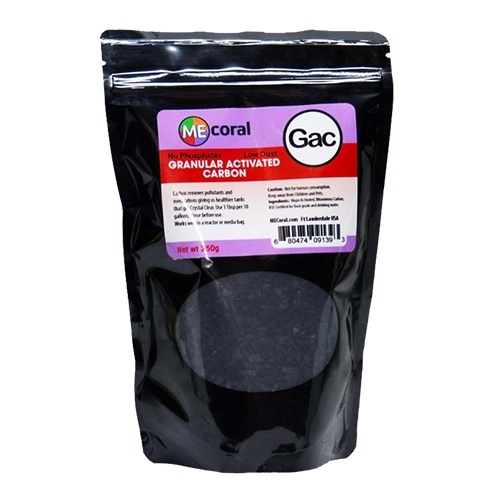 Granular Activated Carbon (Gac) removes organic compounds, medications,pollutants and other chemicals from our aquarium. It also removes yellowing from the water making it crystal clear and giving the inhabitants a healthier tank. We use high quality large particle size carbon which makes it easier to use with less dust. The large particles have large pores which are better for removing pollutants. Rinse Carbon before use to eliminate the loose dust. When using a media reactor do not tumble carbon as this produces dust. It is also effective in a media bag placed in the sump. Change as needed. Use 1 tbsp per 10 gallons. Bag content is 250 gr. ME Carbon is a Virgin Activated Carbon made from Bituminous coal. 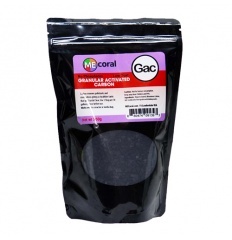 It is excellent at the absorption of organic matters in aquarium water.